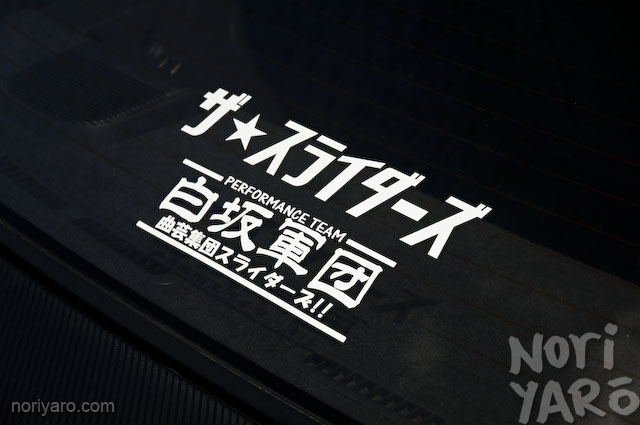 “The Sliders” sub-team “Shirasaka Corps” has gone with a very distinct theme for their drift cars. Matte-black kyusha wheels, and NA engines. 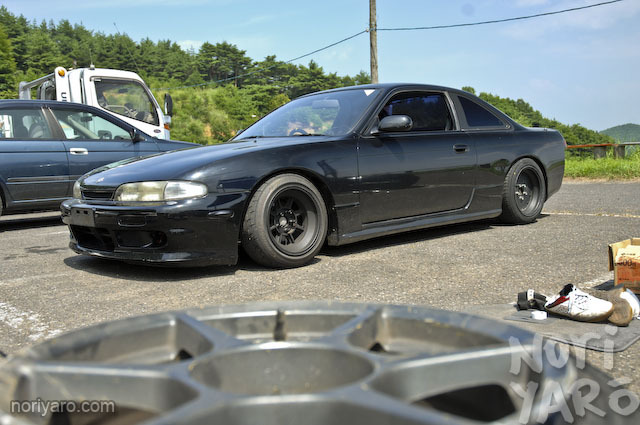 This is team member Satou’s S14 zenki. The Sliders is a legendary team that’s a bit over 20 years old from the mountains of Saitama, just west of Tokyo. 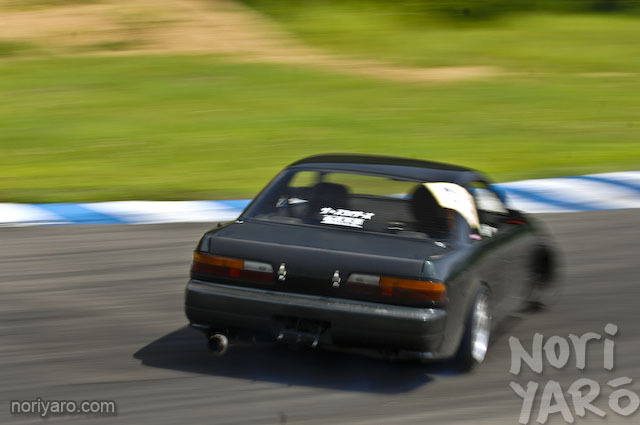 The leader of the team used to drift a brown S130 Fairlady that appears in a few older Option videos. These guys drive Silvias though. 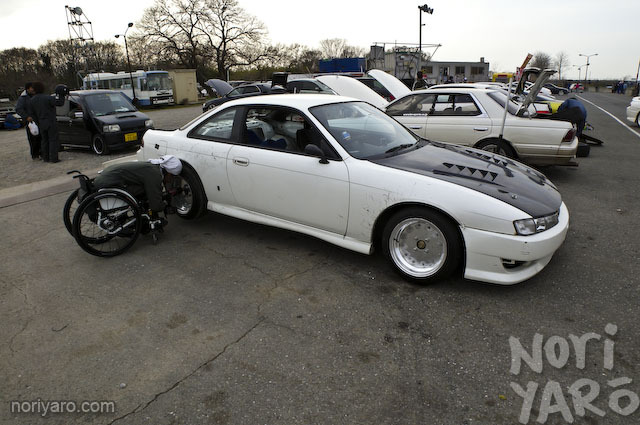 Kakinuma here used to drift a JZX81, but now he has this NA S14 Silvia. 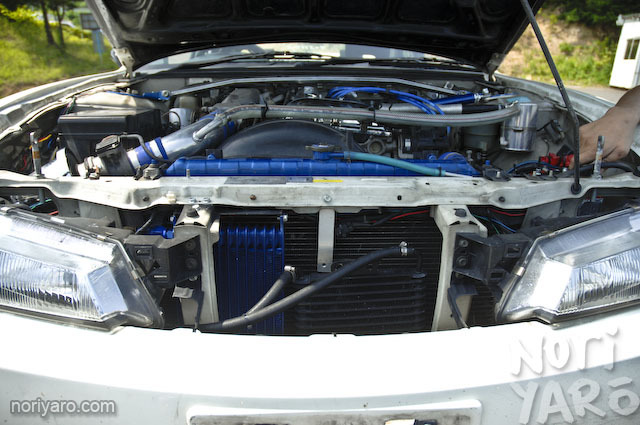 The Silvia is automatic, so he runs a trans cooler up front next to the oil cooler. Why is it automatic? In case you didn’t notice it before, Kakinuma needs to use a wheelchair, but he doesn’t need any help changing his wheels or getting in and out of the car. 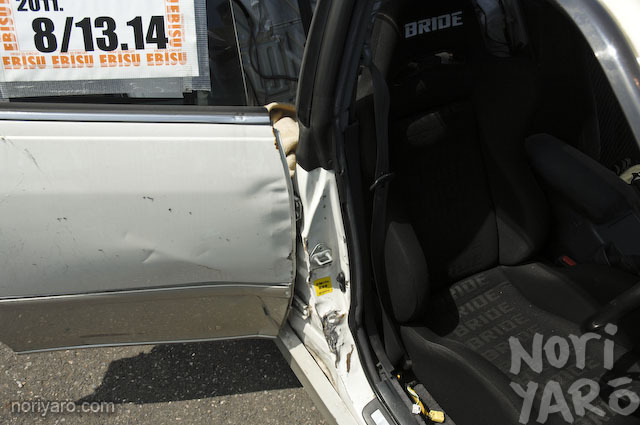 Here’s how it looked a little while ago when I saw it at Okegawa. You can see the hand controls there on the left. Brake and accelerator on the one lever, along with an indicator switch and horn button. Takahashi’s S13 is the cleanest and lowest of the lot. He also drives it the hardest. It’s breaking the theme a bit, but Ariga’s JZX100 is still tough. It had been involved in a nasty t-bone accident, but a bit of a yank with a chain sorted that out well enough. Awesome team. 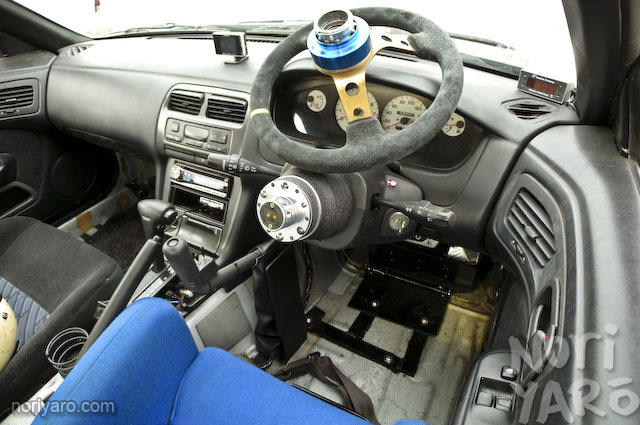 It says something about skill for people who drift in NA cars and don’t rely on high output horsepower. Does Kakinuma also drive a s15? That’s definitely my choice of car building here, much of oldschool flavour, very like them! yes that s13 is so clean and looks so mean towards the night time with the yellow headlamps. they sounded good also tandemed with a couple of them. Great crossover: new cars with oldskool wheels! The Hoshino Impuls lool lovely in matte black! 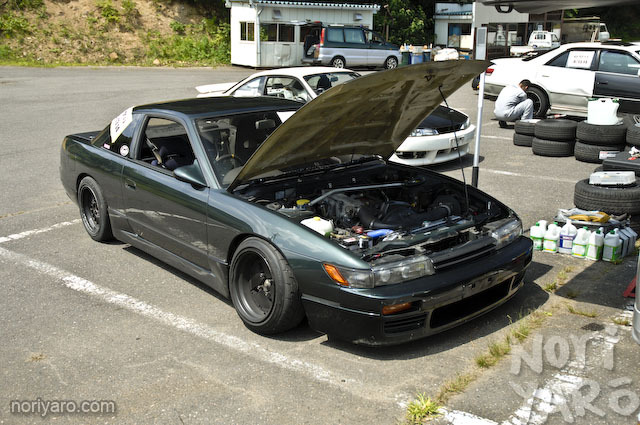 I love how much wider the front of the S14 in the 4th pic is comparied to the front!!! a touch wider in the rear and that would be purrfect! 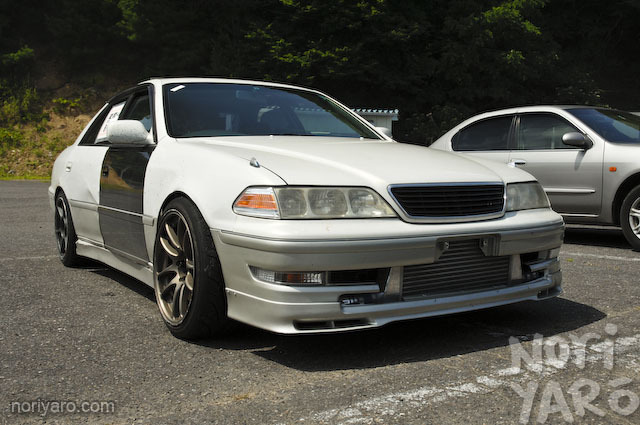 I’d like to see how hard that JZX100 is to do a wheel alignment on. edit: dammit i meant comparied to the rear!! probably more reliable too eh? awesome that the dude in the chair slides with hand controls. that is dedication right there. 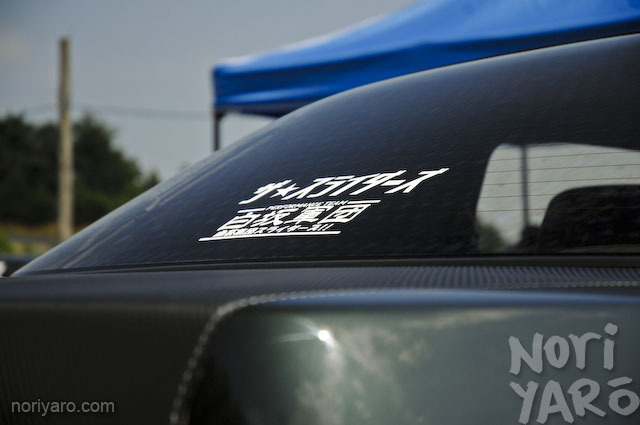 What spoiler is on the white kouki s14?